Ernst Düllberg was born on 28 March 1913 at Unna in Westalen. At the outbreak of World War 2, Düllberg was serving in the Stabsstaffel of I./JG 3. On 21 July 1940, he transferred to 8./JG 27. He recorded his first victory, a RAF Blenheim bomber, on the 1st of August. On the 5th August 1940, Düllberg was appointed Staffelkapitän of 5./JG27. By the end of 1940, he had claimed a further five victories over England during the Battle of Britain. During the brief deployment of II./JG27 to Russia during operation Barbarossa, Düllberg claimed a Russian SB-3 bomber shot down before the unit was relocated to North Africa. On the 22nd of November 1941, Düllberg was wounded in aerial combat with British fighters but managed to return to his airfield at Ain-el-Gazala where he made a successful belly landing (Bf 109F-4 trop W.Nr. 8466). It would appear he was the victim of Australian ace Alan Rawlinson (8 destroyed, 2 probable and 8 damaged victories) of 3 Sqn RAAF. In February 1942, Düllberg returned to combat duty serving with 5./JG 27. 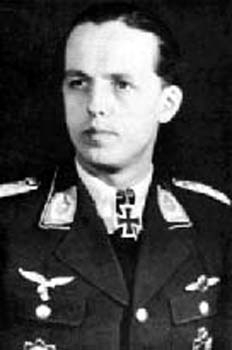 On 26 May, he was transferred to the Geschwaderstab of JG 27 and was replaced by Ernst Börngen. On 11 October 1942, Düllberg was appointed Gruppenkommandeur of III./JG 27. Düllberg’s total had reached 18 by the end of 1942. By the end of 1943, he had increased his score to 28. In the spring of 1944, III./JG27 was relocated to Germany to undertake Reichsverteidigung duties (defense of the Reich). Düllberg was awarded the Ritterkreuz on 27 July 1944 for 35 victories. On 7th of October 1944, Major Düllberg appointed Kommodore of JG76. He led the unit to Hungary where he led all the fighter units operating in the southeast: II./JG51, II./JG52 and III./JG53 in addition to the Hungarian fighter units. Düllberg claimed his last eight victories, all Russian fighters, during this period. In February 1945, Düllberg underwent conversion to the Me-262 jet fighter with III./EJG2. In March 1945, he joined II./JG7 "Windhund", leading ground forces of this unit until the end of the war. Ernst Düllberg was credited with 45 victories in 650 missions. He recorded nine victories over the Eastern front. Included in his victory total are 10 four-engined heavy bombers. Düllberg died on 27 July 1984 at Essen.